Over the years of serving customers around the Jacksonville area, we’ve run across some plumbing myths that actually end up causing damage and can lead to costly repairs. To help you save money, here are some plumbing myths debunked. While putting lemons down the sink will make you kitchen smell good, the citric acid in lemons actually corrodes the metal of your disposal and the peels may clog it. Ice cubes are a better option for cleaning the disposal. They will polish the blades, clean the inside of the disposal and help eliminate odor. 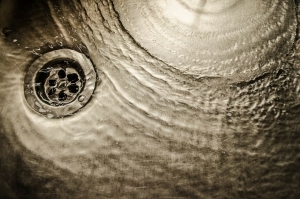 Hot or even boiling water will not remove grease or help it flush down the drain. Grease sticks to pipes and drains and can harden and create a thick coating in your pipes, creating long-term issues. To properly dispose of grease, either wipe it out of the pan or pour it into a disposable container and put it in the garbage. Well flushable should mean flushable but we don’t recommend it. They don’t break down fast enough to be truly flushable. They can snag on pipes and cause serious blockage to the system. If you do use them, the best place to dispose of them is in the trashcan. Tablets containing bleach that sit in the tank can damage the working parts of a toilet. Putting bleach in the bowl to clean it is just fine, but to prevent damage, don’t leave bleach in any longer than 10 minutes. This can backfire by displacing too much water making it necessary to flush twice. Plus, bricks will deteriorate over time, which will cause other problems for your toilet. Hair is tough on drains. No matter the length of the hair – short or long – it can create a clog by getting caught on the interior surfaces of pipes. This goes for pet fur too. When pet owners wash their animal in the sink or bathtub, the animal’s fur mixes with the shampoo to create lumps that can clogs drains. To prevent fur or hair clogs, place a mesh or plastic hair guard over the drain opening. Like any profession, plumbers vary in knowledge, experience, cost and quality of result. Call Troy Trawick Plumbing for an established name you can trust. We are dedicated to assisting the great people in Duval, St. Johns, Clay and Nassau counties with all of their plumbing needs. If you have questions or are experiencing a plumbing problem, please call us (904) 721-8400. Hi! We’re so glad you enjoyed the blog. We’re always more than happy to be a wealth of information and if you have more questions, feel free to contact us!